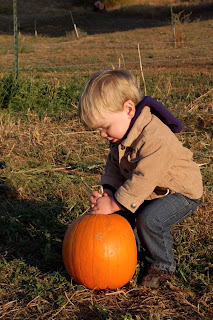 We actually went to the pumpkin patch about 3 weeks ago, before Cory and I went to Arizona. 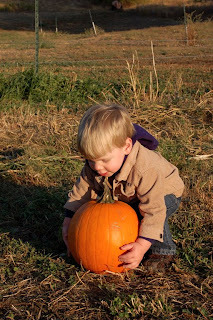 Cory found his own pumpkin, but it was just a little too big for him to carry! Can I get some help here, Daddy? They had a corn maze. It wasn't exactly a maze, more like a walk through a corn patch. But it was interesting. 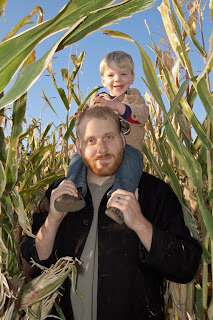 Cory kept getting hit in the face with the corn stalks. It was more open down at the ground level so eventually he got to walk. But I LOVE this picture! I washed it out a bit and it turned out really fun! 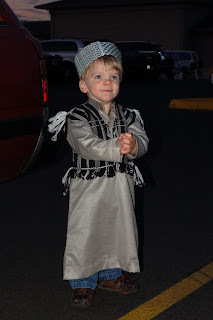 Now for Halloween... we have a reprise of our Little Arab Boy. 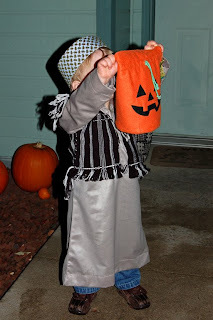 Unfortunately since we went to church people thought he was a Bible character... Not quite! He's just figured out how to hold his hands together. And he really has no idea what we're doing! Our church holds a Light the Night event in the parking lot where people decorate their cars with a theme and give out candy. It's really neat, but there are so many people there I think it was a bit overwhelming for Cory! 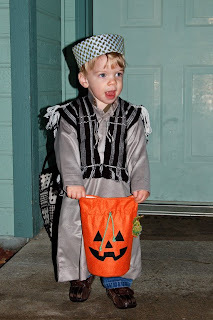 He figured out that if he held his bag just right though... he would get candy! And no, we never did carve our pumpkins! I went out on Halloween to check and the top of mine was very mushy. So much for that idea! Oh my gosh!!! 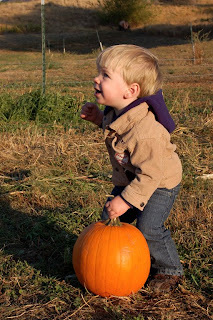 Such a cutie pie - love the picking up the pumpkin pic. They always want to pick up the biggest pumpkin they can find. I have a picture of The Bean doing that every year so far I think. 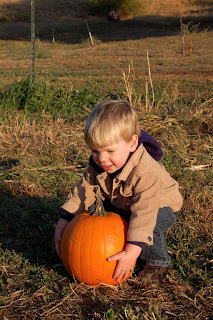 Big pumpkins must have a kid magnet.